If you are short of time, the answers to the following 3 questions should let you know all you need to about the Pro 1500. If we have missed something, let us know in the comments. If you want more detail, you can read our full Oral-B Pro 1500 review further down the page. Most certainly not. It is a solid electric toothbrush that cleans well – we rate it as the best electric toothbrush for sensitive teeth. It is not laden with features that you won’t use. Simple but effective. A travel case would have been a nice addition in the box. As the 1500 is an upgrade on the Oral-B Pro 1000, the 1000 itself is worth consideration. Technically the 1500 is better and worth the extra spend, if you can afford it. But the 1000 is still an incredibly solid option for those unable to justify the extra dollars. 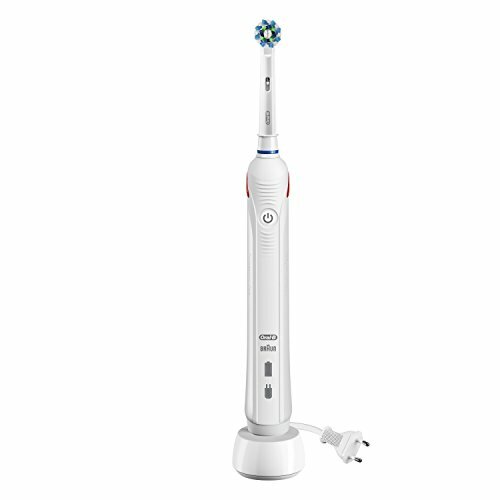 For those looking for a little extra, it is worth considering the Oral-B Pro 6000 as this offers extra cleaning modes and a slightly different design, not to mention Bluetooth connectivity. 3. Where’s the best place to buy the Pro 1500? At the time of writing the Pro 1500 is not sold in as many stores as some of the other models from Oral-B. We have listed a couple of retail options below, and it’s always worth checking out eBay. Our recommendation is Amazon as their price is usually very competitive and delivery is pretty quick too. For me, small revisions, to make an already popular product better, are very much welcomed. The Pro 1500 is a great example of this. What it does is take the form factor of the very popular and cost effective Pro 1000; improve it slightly, to make it a bit more current and differentiate it from the 1000. These small changes bring in my opinion an addition to the Oral-B range was missing. This could well be, from the spec sheet at least one of the best electric toothbrushes for the money. Here are what I consider to be the pros and cons of the Pro 1500. Design – A slim profiled handle with lots of grip and light in hand too. 2 cleaning modes – A powerful ‘daily clean’ and a more gentle ‘sensitive’ mode, gives users the most desired modes. Battery life – Solid 2 weeks of battery life thanks to a new Lithium-Ion battery. Box contents – An extra brush head or travel case would be a nice addition. I and the team here at Electric Teeth will be the first to tell you, that you don’t need to go and spend hundred of dollars on an electric toothbrush. Bluetooth, extra cleaning modes, travel cases and color options are all nice to haves and do arguably add to the overall package, but they are not essential. From the benefits that an electric toothbrush brings, the Pro 1500 has those ‘essential’ items in a slim and lightweight body. An upgrade on the Pro 1000, the 1500 has improvements in the motor and battery life, whilst introducing an extra cleaning mode and a visible pressure sensor. It may well look a bit clinical with an all White color scheme, but that can be forgiven with the light and slim in hand feel of this brush. The handle is approximately 2.3cm wide and 2.9cm thick, with a cylindrical esq look and feel to it. At 129g it is not heavy and this size combined with the grips on the handle make it easy to keep hold of in hand and move around the mouth. The handle contains the battery, motor and other high tech stuff that allows the brush to perform so well. Fairly minimal in its appearance, there is a single power button in the upper third of the brush handle. A series of small ridges sit above and below this, direct the finger of thumb to that button. In the lower third is the Braun and Oral-B logos and battery status icon. This is for the battery sealed inside the brush, that offers up to 2 weeks usage time. The indicator changes color to give feedback on the charge remaining in this battery. Running down the front of the handle is the White rubber strip which offers a nice textured surface to grip onto, with a slight softness to the touch. On the rear of the handle are more grips, this time moulded plastic ridges. Firmer to the touch they serve a purpose. The plastic is a gloss White color on the handle and the detachable brush heads are too made from this same plastic. At the neck of the brush, on the back, is an Orange/Red plastic panel, this is the pressure sensor. The 1500 will sit upright on a worktop. If you take a look at the bottom of the brush handle you will find a recess into which the supplied charging stand fits. The look and feel of the brush handle is essentially identical to the Pro 1000 and 3000 that sit either side of the 1500 in the Oral-B range, just with a couple of small aesthetic differences. To take advantage of the cleaning power of the 1500, you need to press that power button and this will launch the brush into the Daily Clean, cleaning mode. This is the 1 of 2 modes available on this brush. Press the power button again and this will change to the 2nd available mode, known as Sensitive. Daily Clean is the default mode and offers the full power of the brush motor, whilst the Sensitive mode is a more gentle option. It is these 2 modes that are most desireable to users. Daily Clean offers that deeper feeling, more invigorating clean whilst Sensitive mode is more gentle, stimulating the gums. It does not feel as harsh or powerful, but still brings the benefits of an electric toothbrush. The Pro 1500 benefits from a more powerful brush motor than the Pro 1000 and even the Pro 3000, to deliver Oral-B’s cleaning action. Known as 3D cleaning, it works by the small round brush head oscillating, rotating and pulsating. With the Daily Clean mode selected, the Pro 1500 will offer 9,900 oscillations and 45,000 pulsations per minute. The Sensitive mode on the other hand offers up to 7,400 oscillations and 33,000 pulsations per minute. Speed and power of the motor can help make for more efficient plaque removal from the teeth, but do not get too worried about the amount of movements and power. More important is actually using the right brushing technique. Most electric toothbrushes are going to be more efficient at plaque removal if used correctly. Brushing with an electric toothbrush is different to a manual brush, so do familiarise yourself on how to brush correctly. Essential to the brush is the brush heads and the Pro 1500 comes with 1 included in the box. The CrossAction brush head, is the ‘standard’ brush head Oral-B provide with their brushes. It has been designed to offer a good general clean to the teeth and gums. The clusters of bristles angled at 16 degrees move in such a way to disrupt the debris and bacteria in the mouth and leave you feeling refreshed after every clean. If your gums are red and swollen and bleeding, this is likely as a result of plaque buildup and the early stages of gum disease. Thankfully, this disease, to a point, is reversible and the Pro 1500 can really help make your teeth and gums healthier. The CrossAction head is just 1 of a range of interchangeable heads that slide on and off the brush handle. Sold separately any of these will fit onto the brush and work with either cleaning mode on the 1500. My personal favourites are the CrossAction and Sensitive head. The softer bristles of the Sensitive head would compliment the Sensitive cleaning mode for a very gentle, but effective clean. Make sure the head of the brush is replaced every 3 months to avoid doing damage to the teeth. It can be difficult to remember when you last changed or replaced the heads. The small round brush heads for me personally allow for better control and reach to the back of the mouth than the likes of Sonicare heads which are larger. However, some may prefer the alternative brands, as the Sonicare brushing experience tends to feel more delicate and less aggressive than Oral-B’s. It is also worth noting that when running the brush does produce a vibration through the handle and a sound as do all electronic toothbrushes. The Pro 1500 has a bit more of a mechanical sound and is a bit louder than Sonicare models which tend to be quieter but produce more vibration in the hand. Sadly many people brush their teeth with too much force and this can over time lead to damage of the teeth and gums. A neat feature that is not present in many other brushes, particularly competing brands is a pressure sensor. The Pro 1500 has a visible pressure sensor built in. This is a fantastic feature and works particularly well for new electric toothbrush users. When the internal sensor detects that too much pressure is applied through the brush head, the sensor is activated and the pressure sensor on the back of the brush handle lights up (Red), catching your eye. As the sensor is activated, the brush will reduce the power of the motor, until such time the pressure is relieved, at which point the motor increases in speed and goes back to full power. The pressure sensor is therefore a safety mechanism. If you listen, there will be a change in the sound emitted from the Pro 1500 when brushing too hard, that is the motor adjusting. Applying too much pressure when brushing can be a cause of damage to the teeth and gums you want to avoid, the 1500 can help with this. Over time you learn how much pressure you need. Bristles should skim the tooth surface. Even if you don’t activate the sensor all that often, it’s good to know its there. You probably know that you should be brushing your teeth twice a day for 2 minutes each time, it is what dentists recommend. To help make sure you brush for the right amount of time, the Pro 1500 has a timer built in. This timer is activated when the power button is pressed. It also has a quadpacer. This breaks the 120 second cleaning cycle down into 4 x 30 second chunks. This timer and pacer are what I consider essential to a good electric toothbrush and can make a significant difference to the way you brush. You should Imagine your mouth broken up into 4 sections. Upper right, upper left, lower right and lower left. The idea is that you spend 30 seconds cleaning each section. The pacer helps you keep an even brushing time on these 4 sections. It is the American Dental Association (ADA) that are one of the leading bodies when it comes to dental advice and information on how to take care of your teeth. It is then pretty reassuring to know that the Pro 1500 has achieve their ‘Seal of Acceptance’ which means the brush has met and surpassed certain standards and tests that the independent board put together. For those who like to brush in the shower, that fine and it can too be rinsed under the tap. I strongly advise against submerging the brush in water and the charging stand is not waterproof. The box contents is limited on the 1500, you have the brush handle, the brush head, the charging stand and the documentation, that is it. An extra brush head and a travel case would be nice, however this is all you need. As is standard for Oral-B models, the 1500 comes with a 2 year/24 month warranty. Providing any fault in this period is not as a result of user damage then it should be repaired or replaced at no cost to you. Perhaps one of the biggest criticisms of Oral-B electric toothbrushes in comparison to a lot of the competition has been the battery life they offer. Most have offered just 1 week, with even the flagship Genius Pro 8000 offering just 12 days. But things are changing with the Pro 1500. In a handle no bigger, thicker or heavier than its predecessors, it now offers double the battery life. Yes, based on 1 user, brushing twice a day for 2 minutes, they can get 14 days or 2 weeks of usage time from the battery. That is 56 minutes of running time. A decent upgrade this is, but Sonicare and some other brands still mange 3 or more weeks between charges. Oral-B have used a Lithium-Ion battery instead of a Nickel Metal Hydride (NiMH) in this handle. When the brush does need charging, it can be charged by sitting it on the supplied stand. White in color the charging stand supports 110-130V and has a 2 pin US plug wired into it. Sitting on a worktop, there is a prong on the top of the stand that fits into the base of the brush handle. It can take up to 12 hours to charge fully. Sadly, should you travel frequently and need to take the charger with you, you will potentially need both a voltage and plug adapter, subject to your destination. The brush offers a little bit more than the most basic or entry level of brushes, so a slight price premium should be expected. Given that is is an upgrade on the Pro 1000, that often sells for around $40-50 despite a suggested retail price of $70 you will have to pay more. A good electric toothbrush can be purchased between $40 and $80 and this brush falls well within this price range. At the time of review the brush is selling for just under $70, which is a tiny bit higher than I would like, but I am sure in time, it will settle closer to around $60, which will be a pretty fair price. We have included a live price comparison of US retailers here. Given that you get double the battery life, an extra cleaning mode and a visible pressure sensor, an extra $10-20 over the Pro 1000, is justifiable. Had an extra brush head or a travel case been thrown in the box for the same money, this would represent a fantastic value brush, but it’s still a great investment. Do weigh up your options though. If battery life if not all that important the 1000 might be the better buy for you. Maybe Oral-B’s Pro 3000 is worth a look. Another $10-20 offers Bluetooth connectivity a 3rd cleaning mode and a brush head storage compartment, but only 7 days battery life. As a guide the cost per head is around $5. A pack of 3 will often cost $15 but can be prices higher, subject to where you buy them from. Therefore, using the average cost (based on one user) over 3 years, the Pro 1500 will cost $123 or $0.11 per day to own. Ultimately the brush is only worth what you are prepared to pay for it. Given the other options out there and all the other brushes I have used, this is most certainly fair. No one toothbrush will suit everyone’s needs and desires, but I believe the Pro 1500 comes pretty close for the vast majority of people. It offers the essential features of an electric toothbrush and performs really well. An extra brush head and even a travel case in the box would sweeten the overall offering when considering the competition and price, but I am being a little picky. You could do a lot worse than the Pro 1500 and for those looking for a great electric toothbrush, this is a fine example. Is the Pro 1500 an oscillating brush? No, it has just the 2 cleaning modes, Daily Clean and Sensitive. For more cleaning modes consider the Pro 5000, 7000 or Genius 8000, or see our post about Oral-B cleaning modes. The brush head that is supplied with the Pro 1500 is usually a CrossAction head. Occasionally different variants exist and may come with a Sensitive or Pro White brush head. You can change the head with any others on offer from Oral-B. There are many that work with the brush handle. There are 6 main brush head options that include Cross Action, Floss Action, Pro White, Sensi UltraThin, Precision Clean and Deep Sweep. Does the Pro 1500 have a pressure sensor? Does the Pro 1500 have Bluetooth? Does the Pro 1500 come with a warranty & how long is it? If purchased new from an approved retailer the Pro 1500 will come with a 2 year warranty. Does the Pro 1500 have a built in timer? The battery lasts up to 56 minutes, which if used on the standard daily clean mode is 14 days based on 2 cleans per day of 2 minutes in length per clean. No, the Pro 1500 does not have a wireless smart guide included. Yes, a charging station is included with the Pro 1500. The charger is a 2 pin US charger designed to be used on voltages of 110-130 volts. The Pro 1500 charging station or brush head holder has not been designed to be fixed to a wall. Can I use the Pro 1500 in the shower? Yes. The Pro 1500 is water resistant so if you choose you can use it in the shower. Avoid submerging it in water. Do you own or have you used the Oral-B Pro 1500? Probably the most comprehensive and thorough review I’ve ever read about any product…some might consider it a bit overkill, but I don’t. Great job. I wish more reviews like this one could be obtained on other similar products. We try to put out detailed reviews and answer most common question and queries people may have and it is great to read it has helped you. Hopefully the ‘sections’ of the review help make navigating the review a bit easier. Hi, I bought this brush and I tried to fill out the warranty. I couldn’t complete the process being it’s not even listed on the warranty questionnaire or site even. Contacted them waiting for a response. Thanks for the comments. We have heard similar experiences, they can eb quite slow to update their systems, which is disappointing.